The University of Wisconsin men's hockey team plays in the Big Ten championship against Penn State. Huge stand by Jones and the D!! 11:02 to play still tied 1-1!! UW's Wagner drives to the net along the goal line but his shot goes high and over the glass. 11:02 left. Badgers spending lots of time in the PSU end, but can't finish. 12:21 left in OT. 1-1. Ustaski, fresh off the bench, slaps a shot that Jones sticks over the glass. Big save by Berry on Richard the rush and puck out of play. Berry denies Dylan Richard from the left side with the blocker. A quick breather for the teams here as the ice is shoved with 9:00 left. Great chance by Richard, but Berry gets the blocker on it and we are still tied 1-1 with 9:00 to play! Besse steals puck from behind and gets great chance, but Jones makes the save. UW's Besse shoots into Jones' stomach after a steal. Wow what a chance!! Berry standing tall for Wisconsin!! Still tied 1-1 with 5:59 to play! Play under review! Penn State celebrates, but ref waives right away. 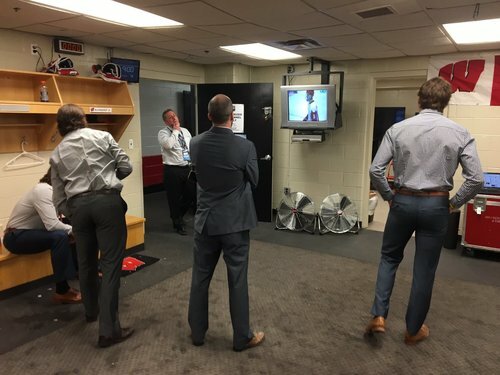 Points to puck location. No goal. Penn State thinks it has a winner on a Goodwin chance that Greenway stopped with his leg. Replay confirms no goal. Call stands no goal still 1-1! 5:04 to go in overtime as Jones covers loose puck. Penalty coming against Pavlychev at 15:15 giving Wisconsin the PP chance in overtime in a tie game! Badgers are getting a power play after a Pavlychev hit on Zimmer in the neutral zone. 4:45 left. Frederic hits the post from the slot. 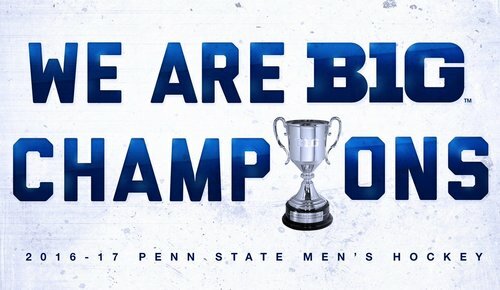 Penn State kills it off!!! Jones gloves a Hughes dump-in with 48.1 left in OT1. 48 seconds left in the first overtime here in Detroit! Tied 1-1! 47.3 seconds left in OT. 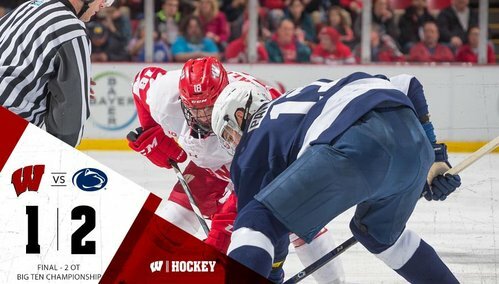 END 1ST OT: Wisconsin and Penn State are tied 1-1. And my deadline is toast. Announced attendance for the Big Ten title game is 5,601, if you're counting. First multi-OT game for the #Badgers since beating Cornell 1-0 in 3OT in the 2006 Midwest Regional final. Sixth multi-OT game for the #Badgers in 54-year modern era. They're 4-1 in previous five. Shots are 45-30 through four periods in favor of UW. 30-13 over last two periods. Ice repairs holding up the start of the second OT. 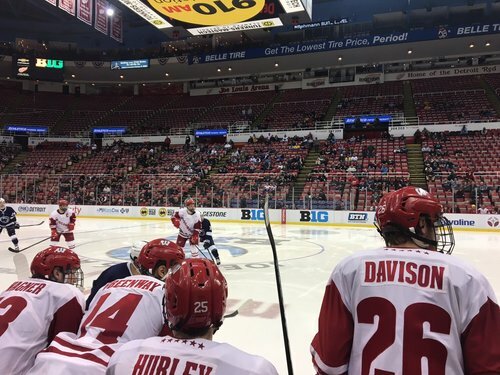 Second overtime is underway in the Big Ten championship game. Wisconsin and Penn State tied 1-1. PSU's Smirnov off the ice slowly after the first shift of the period. Wagner's long shot is gloved by Jones 1:51 into 2OT. Freytag one timer blocked on 3-on-2. Badgers with a great chance for Malone set up by Cavallini but it stays out. Jones having a career game! Already a career-high 48 saves and approaching the Penn State single-game record! Great setup by Cavallini to Malone, but Jones makes the save. Besse stopped on back hand from right wing. UW's Besse drives quickly up the right and gets a backhand shot on, but Jones closes the five-hole. Jones denies a Freytag one-timer with his left pad. Berry holds after a puck rolls in on him slowly. 13:40 left 2nd OT. Penn State wins 2-1 on a breakaway goal by Liam Folkes 6:43 into the second overtime. Liam Folkes scores on a PSU breakaway, his second of the game, and 2-1 is the final.